A week after Antonio McDyess, Chauncey Billups, were dealt to Denver for Allen Iverson, McDyess is expected to be bought out of the two years remaining on his contract today. The Cavaliers and Celtics have expressed interest in him. “I saw that Boston and Cleveland were interested,” said Pistons coach Curry before the Celtics beat the Pistons, 88-76, last night at the Palace of Auburn Hills. The Pistons are also interested in signing him back. However, they will have to wait 30 days before he can re-sign. Also, the most Detroit can offer him is $1.5 million. Boston and Cleveland who have money left from their mid-level exception or trade exception, can pay him more. McDyess and Celtics forward Kevin Garnett share the same agent in Miller. Garnett said he would “root for” McDyess becoming a Celtic. 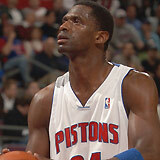 McDyess is a versatile player who can play both power forward and center. He would fill the role vacated byÂ forward Joe Smith after the trade for Mo Williams. Also, he has a good relationship with Ben Wallace. The Celtics have 15 guaranteed contracts on their roster and have $2.4 million left.Â The Cavs,Â have just over $5.1 million which they could use to sign him. However, it will cost the Cavaliers double that amount since they are already above the cap limit.